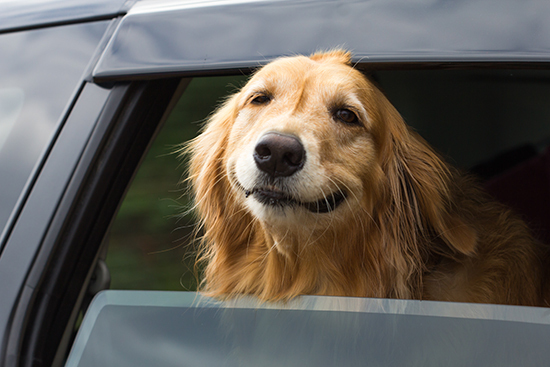 Many dogs love car rides, but others associate the car with something negative. The remedy to fear of car rides is practice and positive reinforcement. 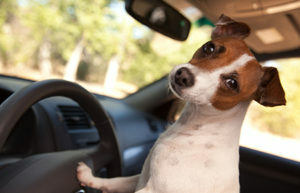 Some dogs suffer motion sickness and feel nauseous in the car. Feeling queasy would make anyone reluctant to go along for the ride. Observe your dog and talk to the vet – pet-safe motion sickness medicine can help turn the experience to something positive. Some dogs dislike the smell of the car, the sound of the engine, and the vibrations. Others have only been on car trips when going to the veterinarian – or even worse, when being surrendered to a shelter. Some may even have been in a car accident. Overcoming these fears will take some patience. Take it slow and keep it positive. It’s okay if you have to spend a few weeks or months teaching your dog about car rides – it’s a joy that will remain with them for the rest of their lives. Start with luring your dog to the car with treats and praise. Use something extra delicious and maybe the dog’s favorite toy. How long it will take for the dog to be able to approach the car depends on the severity of the phobia. Be patient – many humans also have phobias that don’t seem rational to others, but even our reasoning minds can’t help us let go of the fear of spiders, snakes, sharks, small spaces, or whatever it may be. Once the dog is comfortable with approaching the car, open all the doors and lure them inside with treats. Having all the doors open can help him or her not feel trapped. When the dog does jump into the car, make them feel the car is where good things happen. Leave the doors open, cuddle, and have more treats. The next step is sitting together in the car with the doors closed. Taking it slow will give a faster result than trying to hurry the process and possibly scaring the dog again. When your dog is comfortable hanging out with you in the car with the doors closed, it’s time to start the engine. Don’t go anywhere just yet, just start the engine, give treats, and turn the engine off. Repeat this a few times until you’re sure the dog is relaxed and feels okay with the situation. The first trip should be short. It’s a good idea to be two people – one to drive, and one to give treats. Drive around the block and give treats and cuddles. As you work your way up to longer distances, make sure to go fun places. If your dog associates the car with going to a drive-through and getting a piece of burger, going to the beach, or visiting their favorite person, it will be a lot easier to get them in the car when it’s time to see the vet.